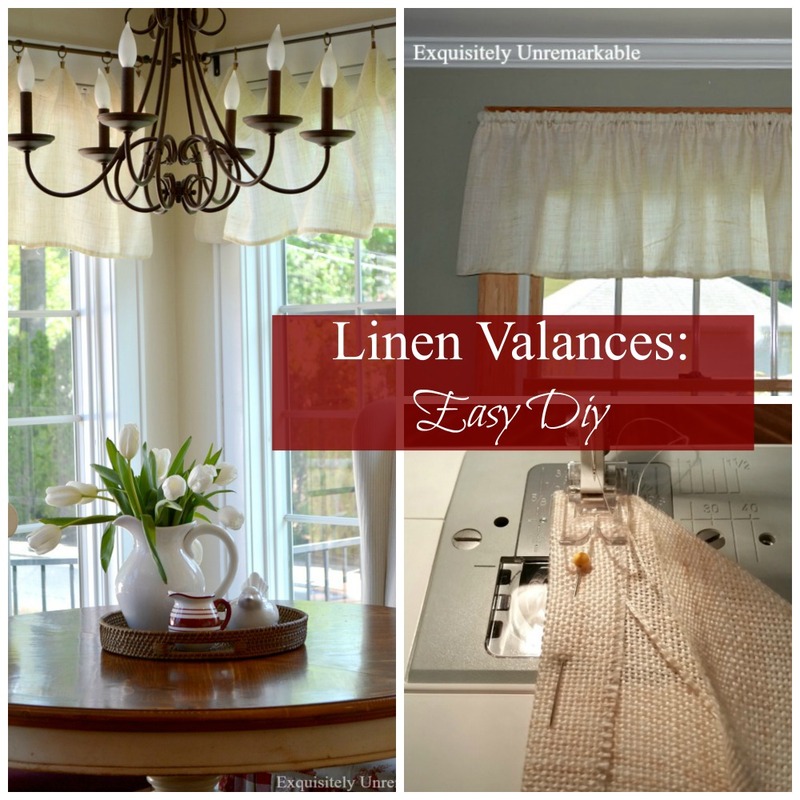 Make easy valances from linen fabric. Hang them on rings or a rod. Here are the trick, tips and pitfalls! Several weeks ago, I updated my kitchen and den by taking some long loved elements out of each room. Curtains in both spaces got the (temporary) boot. 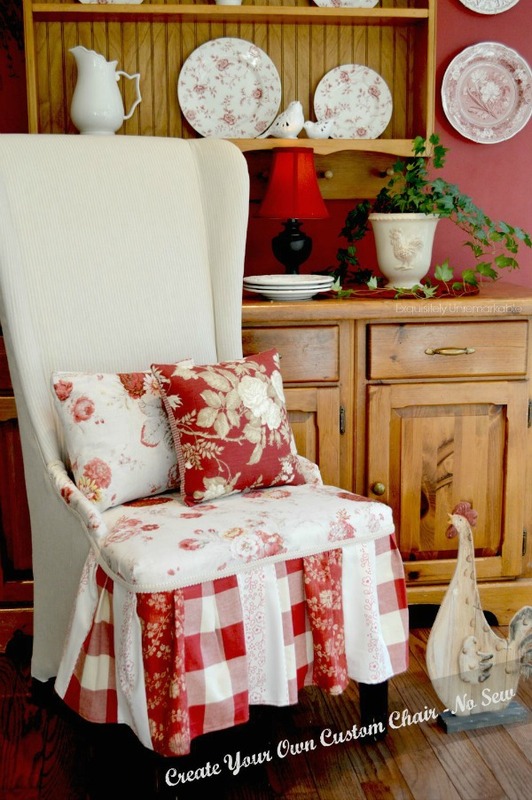 A custom made pair of dark red, ring clip rooster valances and red gingham rod pockets were tucked away and replaced with lightweight linen versions. 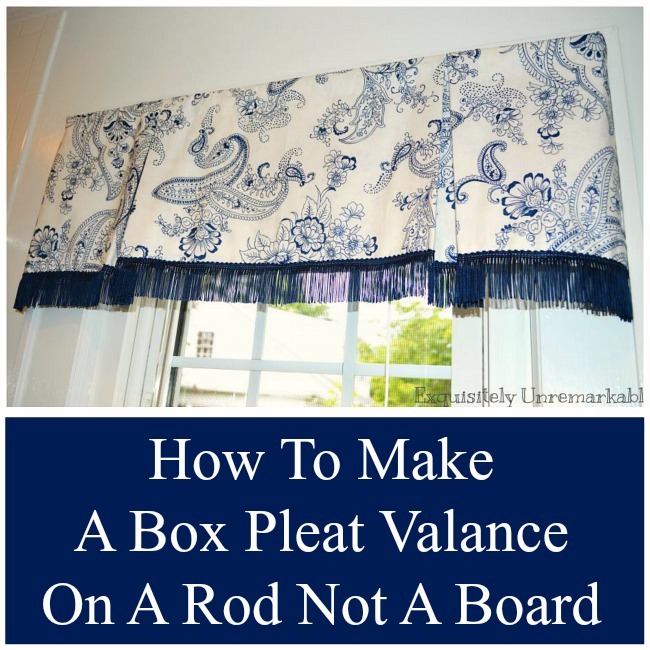 Since that post, I have received several emails requesting details about the processes, particular measurements and asking what it was like to work with linen, so I decided to whip up a brief tutorial on both valances. I have to say that the sewing, measuring and stitching were all done in a straightforward fashion. I made them, following the same patterns I have always used for ring clip or rod pocket styles. The difference here was the material. It was the first time I had ever worked with linen and I was a bit nervous. While there was a much larger learning curve with linen than the first time I worked with lace, my fears were largely unwarranted. Especially since I was not gunning for perfection. I think it may be genetic. Although I could just be lazy. Either way, I am thrilled with my results...and here is my process. To start, I have to tell you that my decision to work with this material was motivated by money and the aforementioned laziness factor. The linen was 118" wide (as opposed to the normal 54") and it was $6.99 a yard. There would be no seaming pieces together and a ten dollar bill dressed the kitchen windows. Cheap and easy gets me every time. But don't tell my husband. For the linen ring clips in the kitchen, I measured the width of my window ~ including the trim ~ and then used a yardstick to visualize how long I wanted each curtain to be. I was using the existing rod, so I started at that point and used my handy clip trick to ensure accuracy. My finished valances are 18" long and 117" wide, as I added a tiny 1/2" hem to each side and the bottom. My rod is 72" wide and I spaced the clips out every 5-6". They are not lined and I did not hem the top of the fabric. There is a raw, unfinished edge that is lightly turned over under each clip, but shows in-between. The rod pockets for my family room update, were just as easy to construct. I used the old gingham ones as a size guide. For full rod pocket instructions, you can peek at my skirted rod pocket side table. I measured and cut my fabric and using lessons learned when making the ring clips. 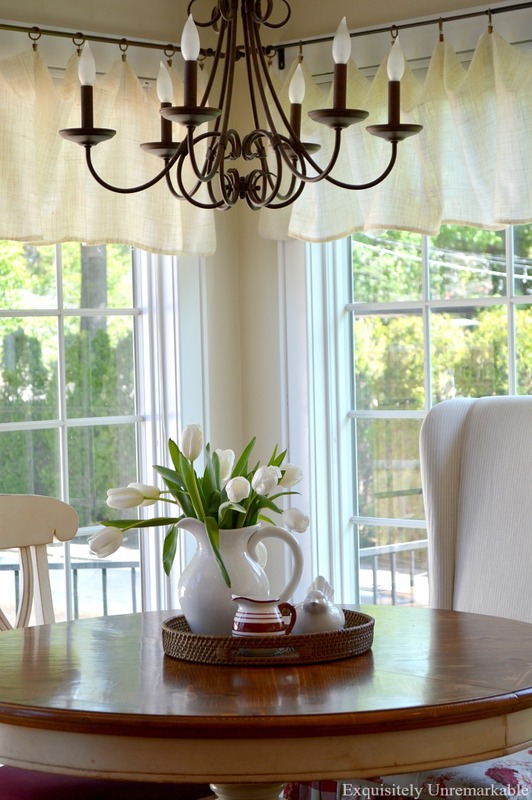 The valances are 14" long. I started with a 17" piece of material...two inches extra for a loose rod pocket and 1" to make a 1/2 inch bottom hem. Each window is a little bit different in this old house, but basically, I cut my fabric about one and a half times the width I wanted my curtain to cover and added one inch for two 1/2" side seams. Like I said, there was a definite learning curve with the linen. For starters, it's so lightweight. 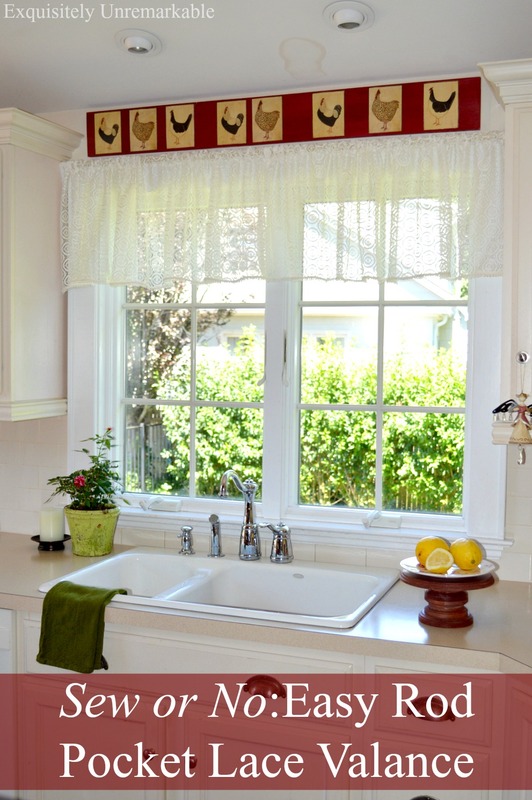 The new valances are the same height and width as my rooster valances, but since the roosters were made with a heavier fabric and lined, even with the same drop, fabric width and clip spacing, they hang very differently. That's ok, I loved the look and knew that going in, but it is something to keep in mind. I also knew it would fray, but I think I underestimated that one. To mitigate this, I doubled all my hems, side and bottom, to stop the material from unraveling and to keep it looking tidy from the outside. Good plan right? 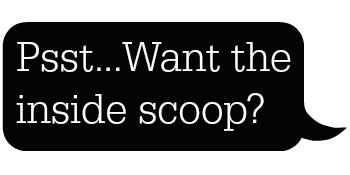 Well, I thought so, until I realized just how sheer the material was. Turns out, it was a very, very bad plan since my problem solving hems showed up as very, very distinct and dark lines. That did not give me the wispy, airy, deconstructed look I had envisioned. Thank goodness for the seam ripper. A better fix was re-hemming the curtains and trimming (and trimming and trimming) the frays. They are tidier now and not in danger of unraveling completely. To be clear though, the edge remains frayed, which is ok, because I like the rustic, tattered look. Heide, from Heide's Quilty Hugs, used my ring clip pattern as inspiration and made her own version! Her valances are more finished than mine, but are still so light and fresh. I was so excited when she sent me photos of her lovely work. 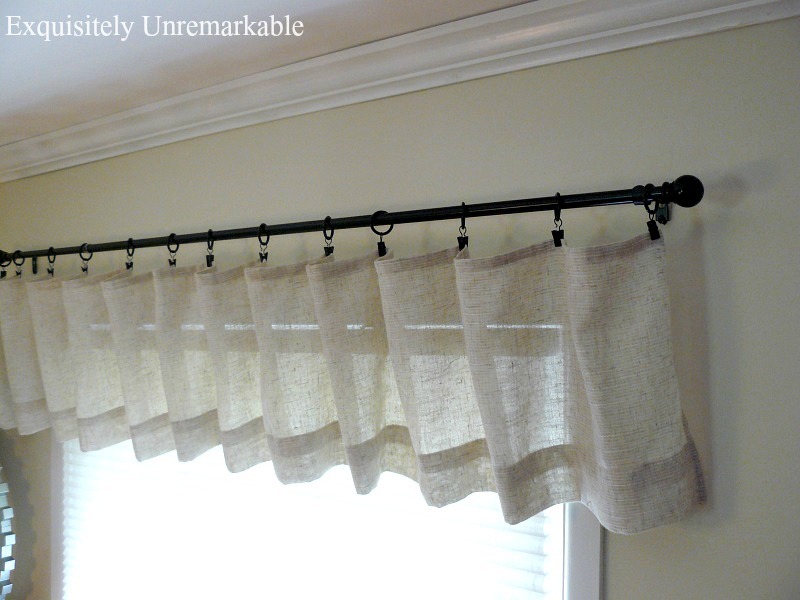 She had found curtains on sale made of a lightweight linen fabric and cut them up to make her own custom valances. I love that kind of creativity! I'm glad that I updated and between the linen and lace, I have definitely upped my skill set, but for now, I think I'm done with my valance projects. Sewing takes it all out of me. I would be hard pressed to do this again in the near future. Unless I come across something else that's fabulously cheap and easy. To see more super easy sewing DIYs, like these, you can click on the DIY tab ---> Sewing tab on the top menu. However you did it, they look great. Over the years I have discovered Fray Check to seal raw edges and I love Fabri Tac glue. I wonder how a really wide seam binder would have worked for a rod pocket by sewing each edge onto the linen. Thanks Cindy!! :) Happy summer! They look great - very light and summery. Good job. I agree . . . however you "did it" . . . turned out great . . . I think linen comes in all different weight. At least the weave looks large in some fabric, tiny in others. 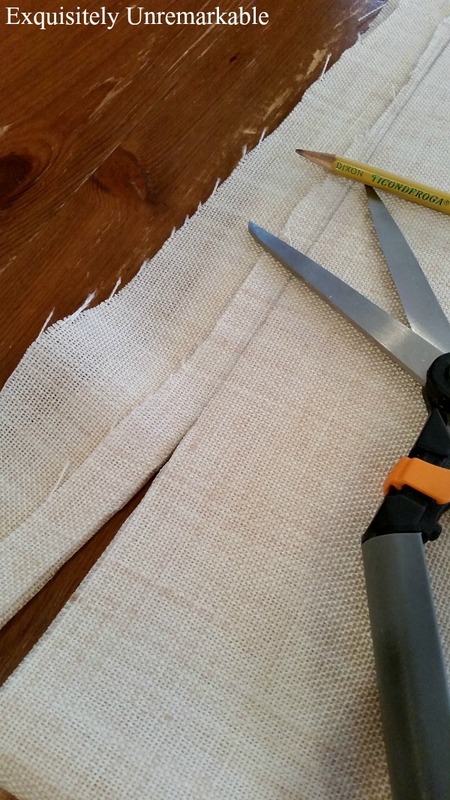 The fraying can be a testy problem . . . BUT . 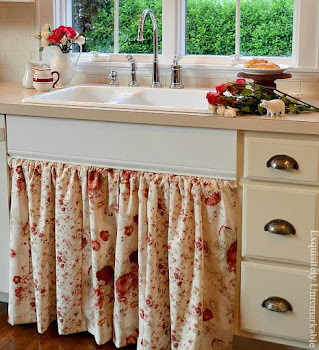 . . you mastered and your valance looks wonderful! These turned out great and they add just the right touch of Summer charm. You are so handy and capable with a sewing machine-I wish that I was. I am really not that capable, Jemma!! ;) I just choose easy projects!! Ha!! But thank you so much for your always sweet comments!! They look so soft and pretty in your windows. I agree linen is not something I want see with every day! It is beautiful when completed but don't enjoy the process so much. You make me miss sewing. You did a great job as usual! I am loving these as well. Great fabric for the summer. I love linen looking fabric. 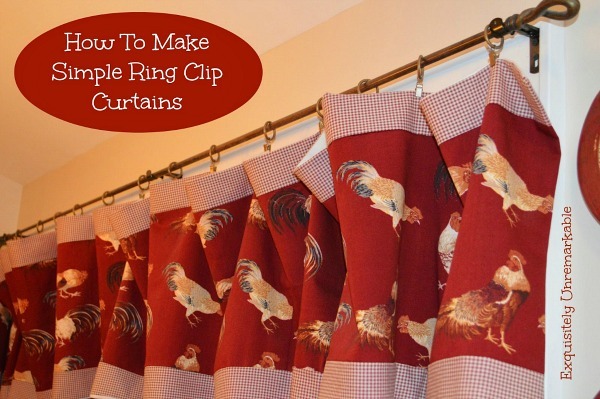 I love your ring clip curtains and am thinking about making some for my dining room. I always start a curtain sewing project with the idea that it will be easy and quick and then the pitfalls start! It usually doesn't go right and then I am exhausted from it all. My sewing machine is on the floor in the back room till I can look at it again!! I admire anyone who can sew something so pretty and so useful since I can't sew to save my life! LOL! You did great still despite your 'difficulties', it's very pretty! They look great, I like the updates. So smart and stylish, Kim! Wish I had more confidence in my sewing skills back in Grade 7 home ec; how I'd love to be making myself a few sundresses right about now! I am slowly gaining more confidence, Poppy. It has taken me a long time, but this week, I actually fixed the zipper on my daughter’s elaborate prom dress and took in a silk dress of my own!! Scary stuff! Ring clips are amazing aren't they? The update looks great! They are my favorite sewing cheat, Ronda!! :) And thank you! They look so fresh and perfect for summer, Kim! I seriously need to learn how to use a sewing machine!! 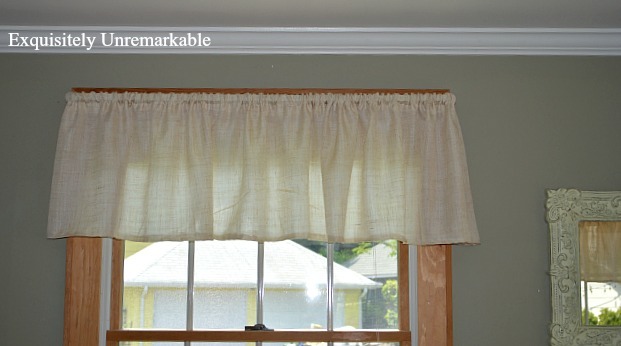 These valances look absolutely amazing - I love the semi-sheer look of the linen, and about the frayed edges? My mom would say, "A galloping elephant would never notice!" 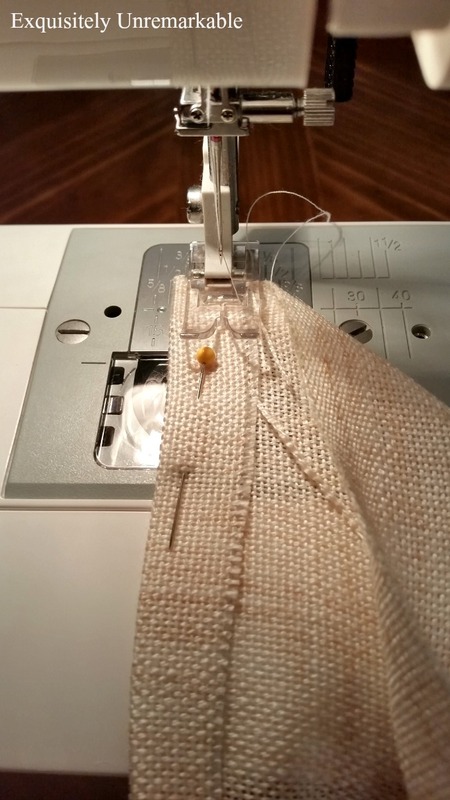 I am a sewing novice so I appreciate the tutorial. Love the look and material...just right for summer. You did a great job Kim!! 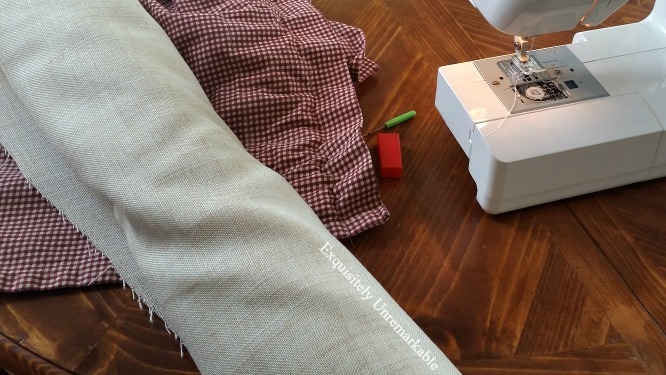 Linen is somewhat hard to work with, but one secret is to cut your piece and then immediately do a wide lazy zigzag around the entire piece (if you have to seam it to make it long enough, do the seam first...then the zigzag). It just holds all of those little threads in place, and does not show up as dark as a real "seam". However you did it all, everything is lovely and light and summery!! !